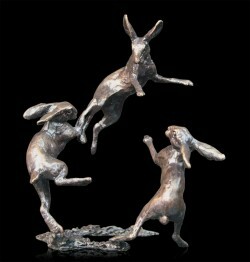 Miniature solid bronze showing three hares boxing. Highly collectable small bronze figurines. These highly detailed miniatures are made from solid foundry bronze metal, and so feel weighty for their size. Butler and Peach is a collection of individually sculpted miniature animals in solid bronze. Each sculpture is presented in a high qaulity cloth pouch, and within an attractive Butler and Peach gift box.